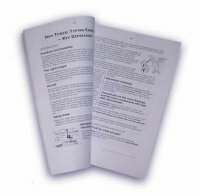 Typing Without Repetitive Strain	is not just a theoretical book but is a guide that is practical and helps you obtain relief naturally. The book comes as a 55 page PDF file which will be sent to you shortly after purchase. You can then read it on your computer screen, or print it out and use it like an ordinary book. The book contains 19 exercises and ideas that may be learned over five days. There are 50 diagrams and illustrations. Everything is explained just as though I were coaching you in person. There is no irrelevant material. Day 1: Understanding the arms, hands and fingers and how they interact with the shoulders, elbows, wrists and knuckles. Relaxation of the hands and arms. This is a necessary preparation for Day 2. Day 2: How to encourage flexibility of the shoulders, elbows, wrists and knuckles. Prepares you for the next day. Day 3: Teaches the six elements that must be present if the keys are to be depressed naturally and without strain. Day 4: How to release the keys without straining. Did you know that the keyboard can do much of your work for you? That saves YOU from having to do it! On Day 4 you learn how to utilise the built in power of the keyboard, saving you unnecessary work and strain. Day 5: How to use the mouse without strain. Revision of the 4 previous days. Typing Without Repetitive Strain does not merely concern itself with posture and movement, unless they are a relevant part of an exercise. With this method, you first learn to tune in to the correct inner feelings and sensations in your arms and hands, and then to harmonise with the equipment you are using. If you are doing this correctly, the keyboard can actually do much of the work for you! Your typing should feel much easier, as it is free from all physical strain. The eBook will be sent as a PDF file to your e-mail inbox instantly. I guarantee you a full refund"
"Recently I've been having no pain at all when typing. I really do appreciate your help!" "Typing feels easier. Now I think of myself as working WITH the keyboard instead of AGAINST it!" that they can resume typing safely. E-mail us for further information on RSI.